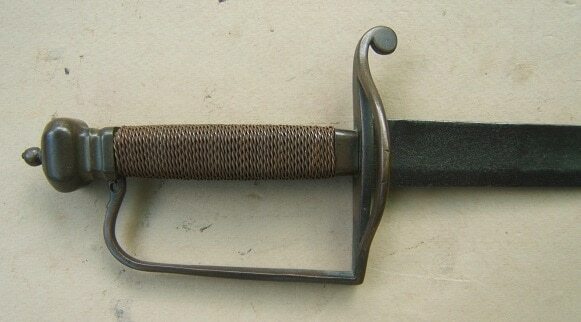 A VERY GOOD FRENCH & INDIAN/REVOLUTIONARY WAR PERIOD PATTERN 1742 ENGLISH-TYPE INFANTRY HANGER & SCABBARD, ca. 1750: In overall very good+ near fine condition with smooth steel surfaces and a lightly toned brass hilt. Of English or German manufacture with a Regulation Pattern 1742, unmarked, lightly toned and stained, single edged, slightly curved, 23 1/4″, cutlass-form back-blade, without a top fuller. Retains approx. 85% polish with a smooth, steel-gray patina. Regulation Pattern heart-shaped, cast, brass hilt with an integral, top-mounted, heart-shaped quillon, a matching single-bar knuckle-guard and rope-turned grip with ball-type pommel (fine blade-tang “peen”. The hilt/guard in overall fine condition with a lightly toned, smooth, brass surfaces. The blade with smooth steel surfaces and a sharp cutting edge: some scattered light patches of discoloration and virtually no pitting. 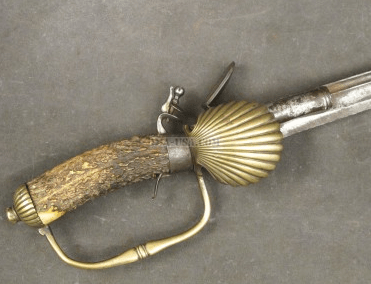 A very nice example of a Regulation Pattern 1742 French & Indian War English/German Infantry Hanger: the type of sword carried by both British & Hessian troops. Complete with its brass mounted scabbard with generally supple, black, leather surfaces and its original brass frog and drag (damaged tip). Good+ body with sound stitches and a leather wrapped repair, towards the tip. Some scattered abrasions, signs of use and expected handling and crazing. For similar examples, please see G. C. Neumann’s: “Swords & Blades…”. Overall length 29 1/4”.